In awarding the cup the Mayor of Wirral said during a meeting of the Council on Monday, “As this is my last full Council meeting,it falls upon me to present the Andy Day memorial cup. I’ve been very impressed by lots of councillors throughout the year, the amount of work that they do as councillors but also throughout their community. I’ve struggled over the last few days to select a particular Member who I believe is worthy of the cup and I’ve come to the conclusion that my nomination for the Andy Day Memorial Cup this year will be Councillor Phil Gilchrist. Cllr Phil Gilchrist said receiving the cup was “totally out of the blue”. 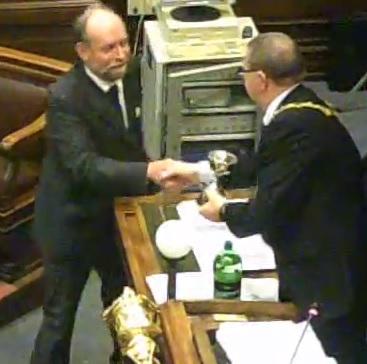 Video of the cup being presented to Cllr Phil Gilchrist starts at 2:20 in the video below. FANCY THAT !! Noble words, not borne out by your hypocritical conduct. Congratulations on the award of this miserable trinket that is now even further tarnished. Ahh I think you mean the early retirement of Jim Wilkie agreed when Cllr Phil Gilchrist was on the Employment and Appointments Committee on the 7th June 2012. However if you look at the voting on that you’ll find that had Cllr Phil Gilchrist voted differently, it would have made no difference to the outcome (5:4 instead of 6:3). Another thing to point out is that Cllr Phil Gilchrist was deputising on that night for Cllr Mark Johnston. However the circumstances surrounding the departure of Noone and Fowler still raise a lot of unanswered questions. No matter. He voted against it. When a Tory like Ian Lewis votes with Labour on Bedroom Tax issues, whatever the result, it gets reported and remarked upon. AND SO SHOULD THIS, particularly given that he later spewed a stream of meaningless guff about “the hard-pressed public requiring scrutiny” which spoke volumes because it flew in the face of his earlier COP OUT. Sheer unadulterated hypocrisy. Shame on this councillor (and the others who failed). You state “unanswered” questions. Scratch that and insert “never to be answered”. Well I could be charitable and point out that between June 2012 and the letter in October 2013 he could have changed his view on such things? However if I remember at the time Jim Wilkie was on sick leave, therefore the E&A Committee felt this plus JW’s stated desire that someone else be chief executive was enough to grant early retirement and not drag things out with a disciplinary process that could drag on for six months (or more) with the same result (JW leaves) but with the increased cost of someone else doing his job and the cost of an outside independent investigator. I realise granting early retirement can be seen as a cop out or pragmatic, but questions about JW’s role as Head of Paid Service in the departure of Noone and Fowler can be put to him whether he works for Wirral Council or not. He’s a politician now on Neston Town Council. Neston Town Council give members of the public the opportunity to ask questions at their public meetings. Wirral don’t do “independent” investigators. Please catch up. You’re making allowances for a hopeless, myopic councillor who furthered the cause of the abusers and their protectors. Meanwhile… nobody extended any charity to the disabled victim of unlawful charging who, because his bank account was plundered for 9 years, became destitute and could neither feed nor clothe himself. The perpetrators of this £736,000 heist were granted an escape hatch 1 day before accountability came knocking – by someone who wanted to abuse power and save his own skin. 6 councillors say, “nothing to see here. Move on…”; one is given a prize for his “distinguished service” and you’re making excuses? I am referring to at the time (although I think this legislation has since been changed or abolished) that if a person at chief officer level or above was suspended (or subject to disciplinary proceedings) that it was then a legal requirement that an independent person outside of the authority do the investigation. As to the independence of the investigation, that’s another matter, but my comment was aimed at the investigator rather than the investigation itself. Politics is an area where two people presented with the same facts can reach different conclusions. Some political decisions are based on what politicians believe is the right decision at the time and by it’s very nature whichever way the decision is made it’s bound to be controversial and unpopular with some people. Facts can come to light later which cast a different light on that decision. You are right that when Wirral Council’s Social Services department had a variety of legal duties not to discriminate against the disabled they did. Social Services were also supposed to represent the voice of those who by the nature of their disability aren’t as articulate as you or I. Martin Morton tried to be their voice and was victimised as a result. Ironically (and there was a Cabinet report on this last night) Wirral Council are now in charge (with the function having been transferred from the Department of Work and Pensions in the recent past) crisis loans/social fund payments for people facing financial difficulties. Although under Wirral Council’s policy nobody is loaned any money any more and they seem to be puzzled why they’re paying out less compared to a previous year when it was administered by the DWP. My last point is that Cllr Phil Gilchrist didn’t make the decision about the early retirement of Jim Wilkie alone, there were Labour councillors on that committee whose votes made the difference as to what happened and therefore it seems unfair (from my perspective) for you to put all the anger you have about that decision on him. One of those Labour councillors was a councillor in your own was of Seacombe, councillor Cllr Adrian Jones, who in about two months time you and other Seacombe residents will get a choice as to whether or not to re elect. Surely there should be collective responsibility of committees for decisions they make? The law has changed now, Wirral’s constitution has also changed. The law has changed so that pay offs above a certain amount (is it £100,000?) have to be decided by a full Council meeting and Wirral Council’s constitution has changed so that compromise agreements over a certain smaller threshold (with some exceptions) are decided by politicians at a public meeting (that is if they had the bravery to have such meetings in public). I can guess though as far as you are concerned that this is the equivalent of shutting the door after the horse has bolted, but at least it means that if the situation were to arise in the future that such decisions would be made by elected politicians (who can be removed by the people) rather than unelected senior officers. I’m not making excuses for disability discrimination, the early retirement of Jim Wilkie or in anyway trying to diminish the importance of what happened and how important it was (and still is) to Wirral Council that things change. I’m not making excuses for Cllr Phil Gilchrist, other councillors or officers. I’m just telling you what happened, the reasons people gave for their decisions at the time. It’s easy at times to think the worst of people. Perhaps you could accuse me of playing devil’s advocate, however there are two sides (and usually more) to every story. Cllr Gilchrist was re elected in 2012 for a four year term of office ending in 2016. If he was up for election this year and writing letters to the press, raising his profile I could understand how you could see it as him doing these things to enhance his chances of getting re elected. However he’s not up for election this year and I really don’t think the voters in Eastham in 2016 (if he’s standing) will remember much (if at all) a letter he wrote to the local paper three years previous? I will also say this about Cllr Phil Gilchrist, which is an observation. If he’s on a committee, he reads the papers sent out and asks questions during the public meeting of officers. If it’s a controversial decision (as the early retirement of Jim Wilkie was) he’ll state his reasons too. This is not something that all councillors do (referring to asking questions as I really can’t tell if they read the papers yet sit there silently through the meeting). The truth of the matter is a lot of undeclared whipping goes on and it’s what happens outside the meeting in one or more political parties themselves outside of the prying eyes of the public and press that determines how politicians vote. The system of democracy we have elects individuals as politicians though and expects them to act independently. The party political system though can result in the opposite effect as politicians are told how to vote. p.s. I clearly mentioned the 6 councillors who made the atrocious decision in my last post (above) … so please don’t put up irrelevant straw man arguments that imply otherwise. p.p.s. You were a Lib Dem candidate weren’t you ? I fear this baggage is what’s weighing you down and biasing you on an otherwise clear case of party political opportunism and hypocrisy. p.p.p.s 24+ approvals in the Wirral Globe comments on this story gives me the impression that Gilchrist has been er, “found out”. People’s opinions can’t be put on one side or ridden over roughshod. In relation to your first p.s. I’ve reread this comment thread and the two links you’ve included. The only councillor out of those six you’re referring to by name is Cllr Phil Gilchrist. P.P.S. The last time I was a Lib Dem candidate was three years ago. If you check the results for Bidston & St. James for 2012 you’ll find I stood as an independent and that the Lib Dem candidate was a Roy Wood. I left the Liberal Democrat Party two years ago and was suspended in June 2011 for (amongst other things) asking questions Lib Dem councillors questions via email about their role in the matters looked into by Anna Klonowski Associates. As (despite a subject access request they’d failed to give me a copy of the complaint before the disciplinary panel meeting) I sued the Liberal Democrat party (and one of its politicians) and won in court as they had broken the law with regards to matters relating to my suspension. However by then I realised the party wasn’t going to change and although I’ve since received an apology from one Lib Dem councillor the Lib Dem councillors directly involved have never apologised to me. I also wrote extensively about that court case, the Anna Klonowski matters and pressed for the Anna Klonowski Associates report to be published. Suing a political party and proving in a court of law that it broke the law (then writing about it), as well as calling for the report on what happened to Martin Morton’s standards complaint in public session (which was about two Lib Dem councillors) are hardly actions that would be expected of someone doing things for either party political purposes (bearing in mind I was a party member at that point) or of “baggage weighing me down”. If I was such a fervent supporter of the Lib Dems as a party member then why was I suspended of party membership by a motion proposed by Cllr Pat Williams and seconded by former Cllr Ann Bridson? No, the truth of the matter (and I’m sure if you asked around you could have this confirmed) is I was a thorn in the side of both the Lib Dem party and its councillors whether disagreeing about what happened over tuition fees or about the library closure fiasco. Stating I’m biased in favour of the Lib Dems is about as ridiculous as stating that you’re a supporter of your former employer Wirral Council because you used to work there. If this is the Wirral Globe comments you are referring to there are currently 11 upvotes on two comments which makes 22, not 24. Are you referring to something different? Yes. I’m referring to the two comments on the Globe’s publishing of Cllr Gilchrist’s hypocritical letter asking for “better scrutiny”. Without checking, I think the positives add up to 40 something. I repeat, the man’s words and actions are not just conflicting … but poles apart.l… as registered by the long suffering Wirral public.